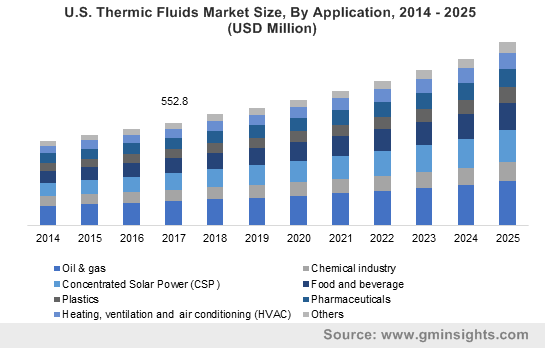 Thermic Fluids Market size was estimated over USD 2.4 billion in 2017 and the industry will grow by a CAGR of more than 6.5% up to 2025. Steps taken by world community such as Paris agreement to combat climate change has increased the demand for solar energy across the globe and this will encourage thermic or thermal fluids market growth over forecast timespan. Thermic fluids are used to improve the efficiency of concentrated solar power (CSP) plants. Its inherent properties such as heat storage helps to increase the electricity generation capacity of plants. Spain and U.S. are among the leading nations having large number of CSP projects and it is expected to increase owing to more investments pouring into this sector. Spain has formulated excellent policies to take the advantage of their resource. They have operational CSP plants with capacity of around 2.3GW in 2017 more than any other country across the globe. Asia Pacific is progressing in the development of CSP projects with growing number of plants in India and China. Other regions such as Middle East, South Africa, etc. are also showing development in CSP projects. The above-mentioned trends are expected to continue and will catapult the thermic fluid demand in near future. Ethylene & propylene glycol, mineral oil & aromatics based thermic fluids account for a significant market share in the global thermic fluid market. These fluids are dependent on crude oil as it is the basic raw material required for production. Volatility in prices of crude oil has a direct impact on the prices of the product and has been one of the major factors inhibiting the global thermic fluid market growth in future. Based on product, silicone & aromatics product segment accounted for more than 45% of share in entire product segment in 2017. Silicone based fluids have lower operating cost as do not degrade, resulting in lesser replacement. They also have low viscosity which gives them superior heat transfer properties. These types of thermic fluids are extensively employed in technical applications such as chemical processing, pharmaceutical processing, oil & gas processing and in CSP plants. On the basis of revenue, glycol based thermal fluids will show a CAGR of around 6% over the forecast timespan. Ethylene glycol based fluids used for cooling & heating process as they are corrosion resistant, easily maintained and have replenishable characteristics. Low acute oral toxicity of thermal fluid is the essential feature required for food processing applications and processes where incidental contact with water is possible. 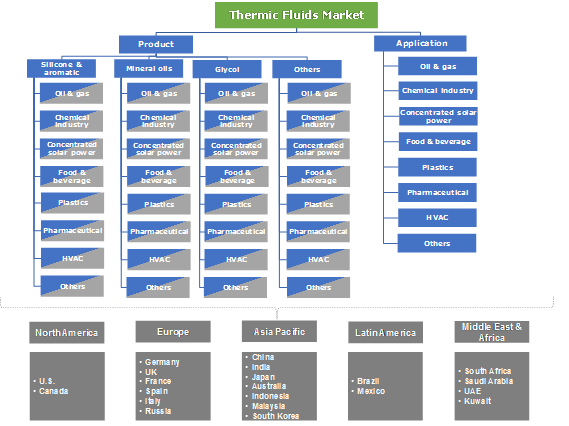 Thermic fluids market has wide end use applications across various sectors and among them pharmaceutical sector shows a growth rate of about 5.5% from 2018 to 2025. In pharmaceutical sector, thermal fluids are used in various operations such as batch processing of products. Thermal fluids can be used within wide operating range, as they eliminate the need of new fluid fills in various operations. On the basis of consumption & production, the U.S. dominates pharmaceutical market around the globe. It had reached around USD 320 billion, representing more than 35% of global market in 2017. Rise in number of patients suffering from chronic diseases will result in more R&D activities to develop curing and prevention medicines & vaccines. This will boost pharmaceutical manufacturing, thus augmenting the thermic fluids demand in coming years. Based on revenue, North America shows a decent growth rate of about 5.5% from 2018 to 2025. This is due to presence of various end-use industries such as pharmaceutical, oil & gas, chemical, food & beverage, HVAC and others. Increasing production of shale oil & gas in the U.S. has shifted its tag from net importer to net exporter. Additionally, legislative decisions taken by new administration will boost oil & gas sector and enables growth of chemical industry as well. The above-mentioned trends will follow and will give an up thrust to thermic fluids demand in future. The major players in the market are Exxon Mobil, British Petroleum (BP), Dow Chemical Company, Solutia Inc., Hindustan Petroleum, Royal Dutch Shell, Dynalene Inc., BASF AG, Paratherm Corporation, Kost U.S.A Inc., Multitherm LLC, Thermic Fluids Pvt. Ltd., Tulstar Products Inc. The industry is consolidated with presence of many global and local players. These players are adopting organic growth strategies such as expanding product range along with plant capacity expansion to get a greater hold of market share in this resourceful market. Thermal fluids are also commonly referred to as heat transfer fluids. The main function of these fluids is to store heat, to prevent excess heating of any thermal device and to transfer heat from one device to other. Major industries where thermic fluids are widely used includes oil and gas, chemicals, plastics, foods and beverages, pharmaceuticals, concentrated solar power (CSP) and HVAC (heating, ventilation and air conditioning). Increasing environmental concerns across the globe has amplified investments in solar power projects and this will significantly propel the market demand in coming years.